For a robotics project I'm trying to track a kite in the air with a camera. I'm programming in Python and I pasted some noisy location results below (every item also has a datetime object included, but I left them out for clarity). I first thought of manually calculating outliers and then simply removing them from the data in real time. Then I read about Kalman filters and how they are specifically meant to smoothen out noisy data. So after some searching I found the PyKalman library which seems perfect for this. Since I was kinda lost in the whole Kalman filter terminology I read through the wiki and some other pages on Kalman filters. I get the general idea of a Kalman filter, but I'm really lost in how I should apply it to my code. Could a brighter soul than me give me some hints or examples in the right direction? All tips are welcome! TL;DR, see the code and picture at the bottom. I think a Kalman filter could work quite well in your application, but it will require a little more thinking about the dynamics/physics of the kite. I would strongly recommend reading this webpage. I have no connection to, or knowledge of the author, but I spent about a day trying to get my head round Kalman filters, and this page really made it click for me. Dynamics (i.e. how you believe states evolve subject to inputs, which are subject to "process noise", which is just a way of saying your model doesn't match reality perfectly). You specify how sure you are on each of these (via the co-variances matrices R and Q respectively), and the Kalman Gain determines how much you should believe your model (i.e. your current estimate of your state), and how much you should believe your measurements. Without further ado let's build a simple model of your kite. What I propose below is a very simple possible model. You perhaps know more about the Kite's dynamics so can create a better one. We then need to describe the system dynamics. Here I will assume that no external forces act, and that there is no damping on the movement of the Kite (with more knowledge you may be able to do better, this effectively treats external forces and damping as an unknown/unmodeled disturbance). x(k) = Fx(k-1) => F = [[1, 1, 0, 0], [0, 1, 0, 0], [0, 0, 1, 1], [0, 0, 0, 1]]. 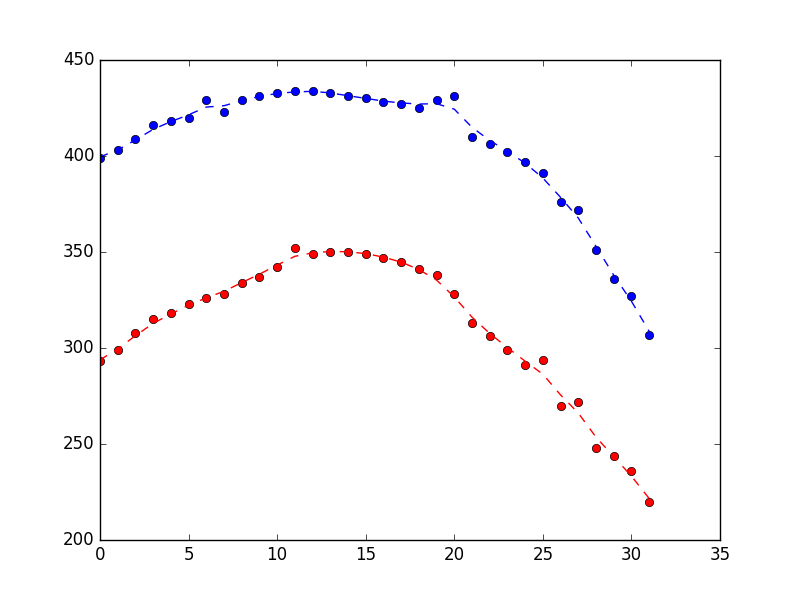 Which produced the following showing it does a reasonable job of rejecting the noise (blue is x position, red is y position, and x-axis is just sample number). The dynamics captured in the model above are very simple. Taken literally they say that the positions will be updated by current velocities (in an obvious, physically reasonable way), and that velocities remain constant (this is clearly not physically true, but captures our intuition that velocities should change slowly). If we think the estimated state should be smoother, one way to achieve this is to say we have less confidence in our measurements than our dynamics (i.e. we have a higher observation_covariance, relative to our state_covariance). Which produces the plot below (measurements as dots, state estimates as dotted line). The difference is rather subtle, but hopefully you can see that it's smoother. Plot below shows the performance of the filter method, including 3 points found using the filter_update method. Dots are measurements, dashed line are state estimates for filter training period, solid line are states estimates for "on-line" period. And the timing information (on my laptop). From what I can see using Kalman filtering is maybe not the right tool in your case. See here for some more and the source I have got the code above from. Not the answer you're looking for? Browse other questions tagged python sensor noise kalman-filter pykalman or ask your own question.